I always say the best recipes follow the worst disasters. And that’s just what happened yesterday. Because if one more thing went wrong, I was debating putting up a ‘Closed, please come again’ sign on the blog all Thanksgiving weekend. The first step was admitting that I’m all baked out at the moment, which probably means I won’t bake for 3 long days before I’m desperate to bake something again. Cooking tends to be less risky when creating new recipes anyways. It’s not an exact science and I get to be careless and wild. Add an extra tablespoon of milk by mistake? There are bigger problems. Dump an extra 3/4 cup of vegetables into the pot? I encourage it. Spill the container of salt in the pot? Ok, that’s bad. You know I’ve been there. And scooping off the salt on top…it doesn’t help one bit. The more I think about it, the more I really love to cook. Salt spills and all. 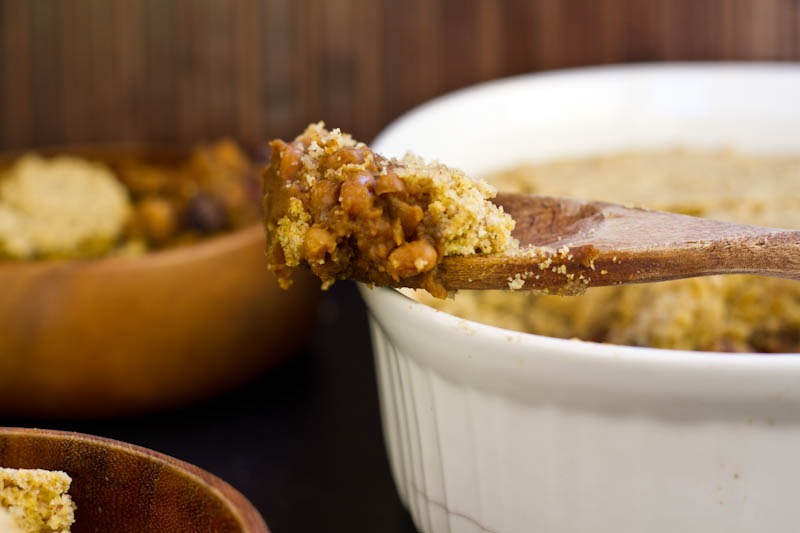 Maple baked beans with a pumpkin twist all topped with a lightly sweetened cornbread. The result is a casserole that kept us coming back for more and more. See my tips & suggestions below on making-ahead, substitutions, and Thanksgiving potluck options. 1. Preheat oven to 400F. In a pot, add a splash of oil along with the chopped onion and garlic. Cook over medium heat for 5 minutes. 2. Now add in the rest of the ingredients and mix well. Cook over low heat until thick, about 10-15 mins. You can make this the night before and leave it in the fridge like I did. 3. In a bowl, mix the dry ingredients. In a separate bowl, mix the wet ingredients. Add wet to dry and stir until combined. 4. Grease a casserole dish (I used 2.3 L), spread in the maple beans, and spoon the cornbread mixture over top. Bake at 400F for about 35 minutes until golden and a toothpick comes out clean. Serve immediately with a bit of Earth Balance on top if desired. Note: Does not keep well for leftovers (it dries out a bit). I suggest serving immediately or halving the recipe if needed. This casserole is inspired by Jessica’s Chili cornbread pasta bake as well as Ashley’s version. I decided to play around with my Maple Baked Beans recipe and it turned out fantastic. The old version is a slow cooker version, but I wanted to create one that could come together in just 15 minutes. I also added some pumpkin and a touch of cinnamon for a seasonal kick! Boy, was I glad I did. And I saved my pumpkin from growing hair over the weekend. As I tasted and cooked, I kept saying something was missing. I tried adding just 1 tablespoon of ketchup and it all came together perfectly. Surprisingly, this was not Eric’s idea but I think he’s rubbing off on me! The cornbread comes together in just a few minutes. I spread the bean mixture into a 2.3L greased casserole dish. The cornbread layer went on top! Then I baked it for about 35-40 minutes until golden. Cook time will vary based on the size of dish you use. Sweet, Sweet casserole we have a winner. 1) I suggest serving this immediately for best results. I tried reheating it in the microwave and it was still good, but keep in mind that the beans soften the cornbread with time. It’s best served immediately. 2) If you plan on bringing this somewhere for Thanksgiving, here’s what I would do: Prepare the bean mixture on the stove top at home and scoop it into your casserole dish. Add your DRY cornbread ingredients into a large zip-lock bag. In a jar or leak-proof container, add your milk and oil (unless of course you can get these two ingredients where you are going!). Once you arrive, all you have to do is mix the wet and dry cornbread ingredients, spread on top of beans, and bake. Just an idea! 3) Can I bake the cornbread on its own? Updates: I baked the oat flour and almond flour version on its own and it was quite crumbly, so I will need to work on the GF version more. I also tried using spelt flour and it held together quite well, but it wasn’t the best tasting version. More testing required! I also plan on making a pumpkin cornbread too. 4) I made the bean mixture the night before and let it sit in the fridge overnight. It saved time and also helped the flavours develop a bit more. 5) The cornbread is quite thick- about twice the size of the bean mixture when baked. We didn’t mind it one bit (I actually preferred lots of cornbread), but I thought I would mention it in case you have different expectations. For my Canadian readers celebrating Thanksgiving this weekend, have a great one! If you’re looking for last minute Thanksgiving recipes, check out my post from last year for lots of ideas. If you’re not celebrating, I still encourage you to make this casserole! We’re off to my in laws tomorrow, with vegan food in tow. It’s a good thing they already know I’m crazy. Will definitely add this to the list of recipes to try! I’ve always had success with your recipes Angela! Happy Thanksgiving – looks like Ontario is going to have some wonderful weather this weekend and for that, I give plenty of thanks! yea I’m loving this weather!! Yummy! This is so perfect Angela! Baked beans and cornbread! Have a great holiday with your fam! I nearly fainted just at the title of this post. Can’t wait to try! Have a great holiday weekend! 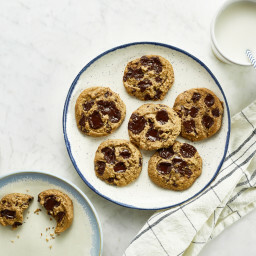 Hi Angela, I absolutely love reading your blog and trying out your recipes!!! I really want to add this to our family Thanksgiving dinner this weekend, it looks delicious! I was wondering if you use fresh pumpkin or canned? 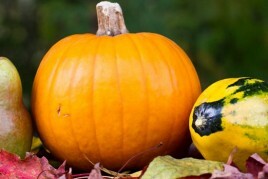 I’ve never really cooked with fresh pumpkin before and was wondering how to go about doing it. Do you have to cook it first? I used canned, but I’m sure fresh tastes even better! Since I’m south of the 49th, I won’t be celebrating Thanksgiving this weekend but I’ll be thinking of you and Eric, wishing you both a very Happy Thanksgiving and dreaming of trying this delicious looking casserole when I celebrate in November. Thanks mom! I will give you a call this weekend. I tried a version with 1/2 cup almonds and 1/2 cup oats ground into a flour and it worked well! Although Im not sure how that would hold up as cornbread on its own. You could probably get away with buckwheat flour but you might need to sweeten it more since it’s so earthy. 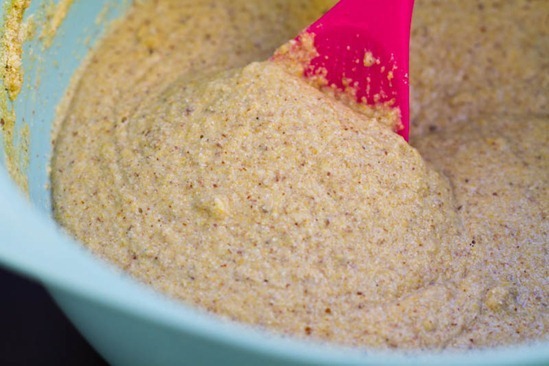 almond and oat flours sound perfect (and I have both on hand!) thank you!! Oh my – now THAT is my version of comfort food! Those just look absolutely phenomenal! I’ve seen something like that on EdiblePerspective (but it was more like chili covered with corn bread). It looks awesome! I made a pumpkin cornbread the other day (not vegan though) – turned out amazing! The pumpkin really makes it deliciously fluffy! It’s nice when you’ve already proved to your inlaws that you’re a bit nuts. It takes the edge off, doesn’t it? oh. my. goodness. that looks amazing. You are giving me a thousand ideas of things to make for my family when I go home over thanksgiving, and I have too many now! Haha especially since we’re going to someone else’s house for thanksgiving dinner! That looks super tasty! Experimenting in the kitchen is fun, but can be a bit frustrating at times. ESPECIALLY when it’s time to wash the dishes! Oh me oh my. That looks so wonderful right now….I want it for breakfast. How is it even possible that you created a dish that includes ALL of my favorite, random foods?! PS. I LOVE you and your blog! “the more I really love to cook, salt spills and all” – I hear ya. Time spent in the kitchen is hard work, but so, so worth it. And your love of food definitely comes through in your posts! Oh man I saw the title of this post and got so excited, this just sounds SO amazing. 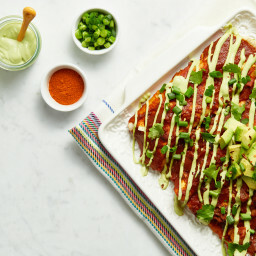 I’m absolutely making this and can’t wait to try it and let you know how it comes out. Another recipe that I need to make, I can’t wait to try it!! Wow this sounds great! I made a version of Ashley’s corn bread last week to have with soup and it was delicious and I really want to try her chili/cornbread recipe. I love your idea of baked beans and corn bread, I’m so excited to try it. Since I’m only cooking for two people I think I will do a quarter batch and put it in personal sized dishes. Happy Thanksgiving!! This dish looks amazing, I have never seen anything like it! I can’t wait to try it out. YUM! Now this is my kind of comfort food! You read my mind! 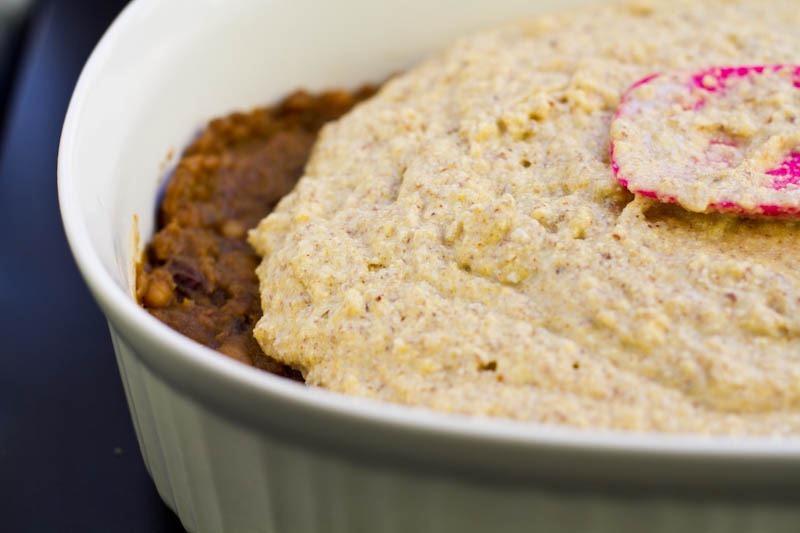 I’ve been craving cornbread and beans lately, so much so that I had a bowl of polenta, sweet bean spread, and chopped kale for breakfast today – mmm….. Will be making this recipe over the weekend! Wow, this looks absolutely amazing! I just saved the recipe and am going to check my kitchen this weekend for the ingredients! Have a wonderful Thanksgiving with your family! Thanks for this! You’re the only Canadian blogger on my blogroll (other than myself lol) so you’re the only one posting Thanksgiving recipes – and this one looks perfect! I can’t wait to try :) Happy Thanksgiving! Angela…you are so creative…it amazes me..what a talent! Looks amazing! Not a huge fan of navy beans though, think another bean could work well with these flavors? This looks delish. I love cornbread on anything. You’ll get your cooking/baking groove back. The harder you try the harder it seems sometimes! Take a break and enjoy your weekend! This looks AMAZING!! I have to try this out on my family- they love baked beans and cornbread so the two together will be a great combination! Can’t wait to try it! Just realized I’m now starving and all I want is this casserole! Oh my god! This is just evil for me. I love pumpkin and maple from my lifelong residence in New England and can’t turn cornbread down anytime I find it. Add baked beans and that just tips me over the edge. I was just thinking about what to make on Monday that would provide leftovers for the week, and this is it. Yum! Do you know of any subs for molasses? It’s not an ingredient I use often so it’d be a shame to buy just for this..
Hmm that is a toughie! I think it’s wonderful in this recipe. I know you can buy molasses at bulk barn (and just get the mat you like) but if not, I would like to think it would still turn out without it! 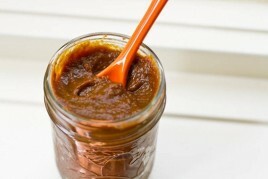 I just made this recipe and didn’t have molasses, either – I subbed in 2.5 TB of brown sugar and upped the maple syrup to 6 TB, and they came out fantastic! Thanks for the great recipe, Angela! This combines 2 of my favorite things! Cornbread and baked beans! I love the detail you give in all your recipes!!!! It makes cooking seem so much less daunting!!! I still remember (and have) all your awesome vegan Thanksgiving recipes from last year. I still can’t believe how much work you put into all of that….and I of course was not the one doing the cooking/recipe sharing, etc. Hope you guys have an enjoyable weekend and thanks for what you do! YUMMMM!!!! This sounds just like a perfect hearty fall casserole. I am going to bake it in a few days for sure. I love all of your recipes! Happy Thanksgiving and remember to relax a bit. 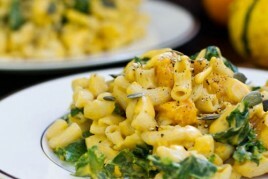 Just wanted to share that I tried out your butternut squash mac & cheese recipe last night and YIPPPEEEE! The kids liked it. We have been vegan 1 year and gluten free for 6 months. One suggested adding tomatoes with the kale & spinach and the other suggested Chipolte chili powder (he likes things spicy). I have it printed off and at home in the kitchen, it is a rare occasion when BOTH kids like the same recipe. Can’t wait for more of your tasty creations. wow that is so great to hear! :) Thanks for sharing. Have a happy Thanksgiving with your inlaws! I always forget that Canadians celebrate TG a full 6 weeks or so earlier than Americans do..enjoy your holiday. wow yum!! i love fall recipes because they are so warm and homey :) i can’t wait to have some thanksgiving fixings this weekend in Canada. Sweet potato pie, here i come! love that you made this with baked beans! yum. Have a great time this weekend. 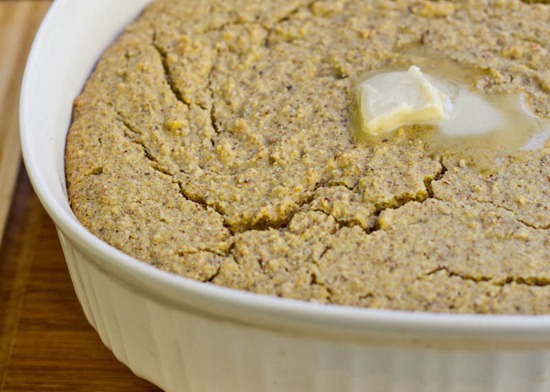 I’ve never had cornbread before so I look forward to trying this, it looks pretty tasty! I just love the fall twist on this. Happy Thanksgiving! Not much to say about this post, although I would like to try it :) I just wanted to say I love your site!! My story/backround is similar to yours in regards to an eating disorder and discovering the beauty and joy of eating healthy and finding balance in life. You are an inspiration! Your recipies and pics are awesome!!! Thanks so much for sharing with us!! Thanks Sarah :) Goodluck with your journey! I am so glad that you celebrate Thanksgiving before we do. I get to check out all of your great stuff and gather ideas a month in advance! This looks like it will be making it to my Thanksgiving table for sure!! Many Thanks to you! 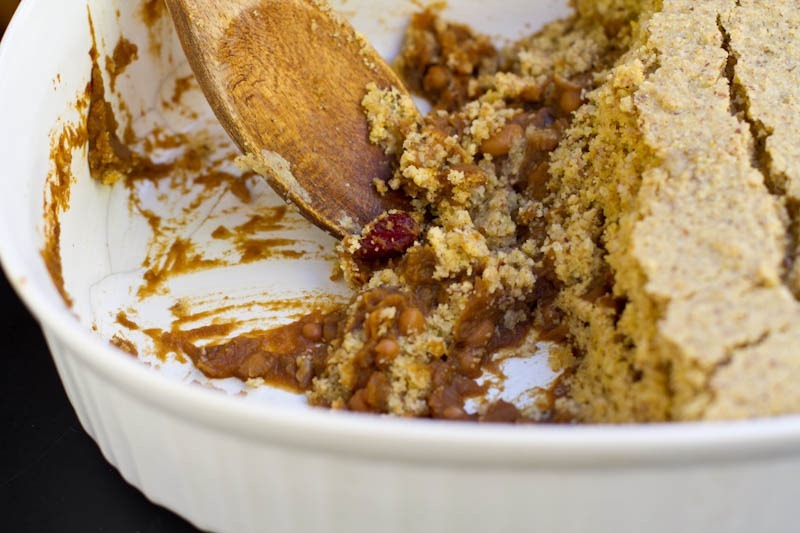 So I am a HUUUUGE fan of your maple baked beans recipe… and I usually make it with vegan corn bread, so I have to try this!! I’m a single person, though… how well do you think this would reheat? I mean, have you had leftovers? Did it last well in the fridge, or did the moister kind of destroy the corn bread? The cornbread definitely got soft with time (more so the part near the beans, not the top). It’s best served immediately, but with that being said, I will be eating the leftovers! You could probably make a half batch? Or just continue to make it separately. Oh my — if I make this I might have to make two batches — one for me and one for my husband! What a great idea! 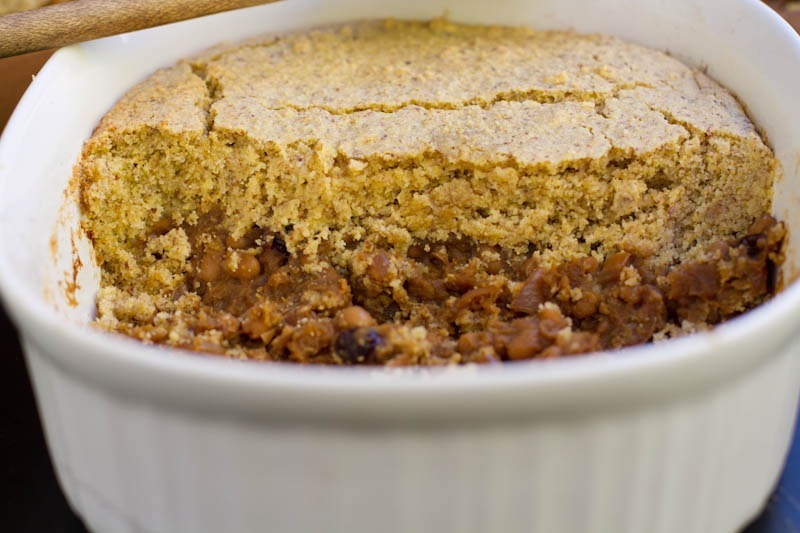 I was thinking of some sort of bean pie earlier this week when I mixed creamy cannelini beans with refried beans — the corn bread crust is genius! OKay I think this is the best recipe you’ve ever come up with! PUMPKIN baked beans!?!!? Corn bread!?!?!?! TOGETHER!?! Ahhhhhh this looks SO good! I’m not a fan of beans, but I am of cornbread!! I’m sad to hear this doesn’t keep/reheat as well the next day. I was thinking how great it would be to take for lunches at school. Perhaps I could just make the beans, and bake some cornbread on the side, and take them separately instead. Baked beans are something on my “must try” list – I’ve only ever had the canned variety (crazy, I know). SO yummy!!! 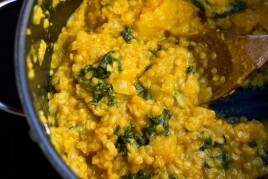 Thank you for making my vegetarian transition a successful one…I’m so happy to find delicious recipes. You are an inspiration!! This looks amazing! Perfect fall meal and I can’t wait to try it. I made this last night for dinner and OMG it was fabulous! I used cannellini beans instead of navy beans and dijon mustard instead of regular yellow, but it was wonderful! It was also a great way to use up that last bit of canned pumpkin I had leftover from another recipe of yours – I will definitely be making this casserole again. Keep up the good work! Oh, and it DOES make for great leftovers the next day. The cornbread is a little more moist on Day 2, but not in any offputting way – I thought it was a wonderful texture. Another idea is to use individual ramekins- you could make the beans and the cornbread batter and before baking keep them separate in the fridge and then just add a portion of each to bake in an individual ramekin each time you want a meal!- its more time consuming but also might be a meal you could enjoy all week/ avoid soggy cornbread! I can’t wait to see your pumpkin cornbread recipe! And try pumpkin in the maple beans. Is itr possible to make a subsitute for the cornbread? I unfortunaltey can’t eat corn and am GF so I am trying to think what I vcould put on top. The beans sound amazing, as your other recipes. I think I have found a place to be my main recipe place! Everything sounds delicious. Thanks so much! You could sub a biscuit on top. I recently made one for my peach apple cobbler that could work! Thanks so much=I could use GF bisquick for the top. Can’t wait to make this! We have so much pumpkin mash right now (we like to cook it up and freeze it to use throughout the year) and I have been so excited to try this recipe. We are going to have it for dinner tonight and I’m going to use sorghum flour instead of the oat/almond combination. I’ll let you know how it turns out. Started a new jon where I don’t have to be at work till noon on Wednesdays. So last weeks morning consisted of your new mac n cheese….turned out amazing! TODAY I made this…..amazing!!! I was short on navy beans, so yes…its a lot of corn bread! But I love it! Thanks so much for your blog! LOVE IT! and tell every veggie lovn’ foodie I know about it. This was delicious! I made it (minus cranberries) in a loaf pan and had to stop myself from eating it all. On the second day, I had no problems whatsoever with the cornbread getting soggy or having a bad texture. Probably because of it being a thicker layer (,since it was in a loaf pan) or maybe because I used stone ground cornmeal. So if y’all can’t finish it in one day, go with a thicker layer of cornbread. I made this for dinner last night, my husband said it was the best thing he’s ever ate! Thanks for sharing all of your great recipe’s! I just made this and it came out great! I halved the recipe no problem. 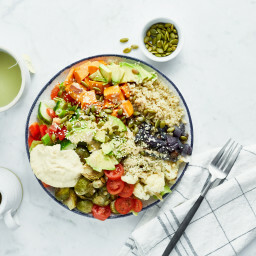 My boyfriend and I have recently started eating vegan and your website has been a great resource for new recipes. This one is definitely going to be a favorite this season! Amazing! This was the first recipe I’ve tried of yours and loved it! Can’t wait to try more. In case you happen to overcook it a little (like I did) & it turns out a little dry: drizzling it with balsamic vinegar or a balsamic reduction is a nice flavor combo! Just wondering, do you think that the sugar for the cornbread could be omitted? I just made this- delicious! Didn’t change anything; it was just perfect. I finally had a chance to make this recipe and it was amazing! I love the tanginess of the beans mixed with the slight sweetness from the dried cranberries. For the cornbread I used whole wheat flour in place of the oat and almond flours and it worked beautifully. P.S. You have renewed my faith in vegan breads! The first time I tried an eggless quick-bread years ago it was gummy and I have been hesitant to try another one but the texture to this cornbread was so perfect. Hello there, this type of cooking is new for us, and we are really enjoying your website! Tried a few things and love them so far. 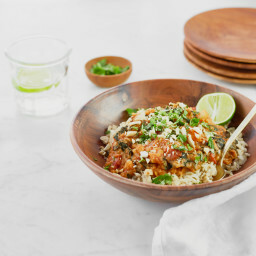 And your website has given me some good ideas to make a few of my traditional family dishes even healthier than before! I do have one question though. A few of your recipes seem to have almond milk, and though i find it great, i cannot cook with it as the hubby is allergic to it. Is there something similar that i can substitute it for that does the same in the recipes? Angela, I’ve been reading your blog for over a year now. I finally got around to making this recipe tonight for my husband and I for dinner. I have to say it was AMAZING! Thank you for such a healthy and comforting recipe! 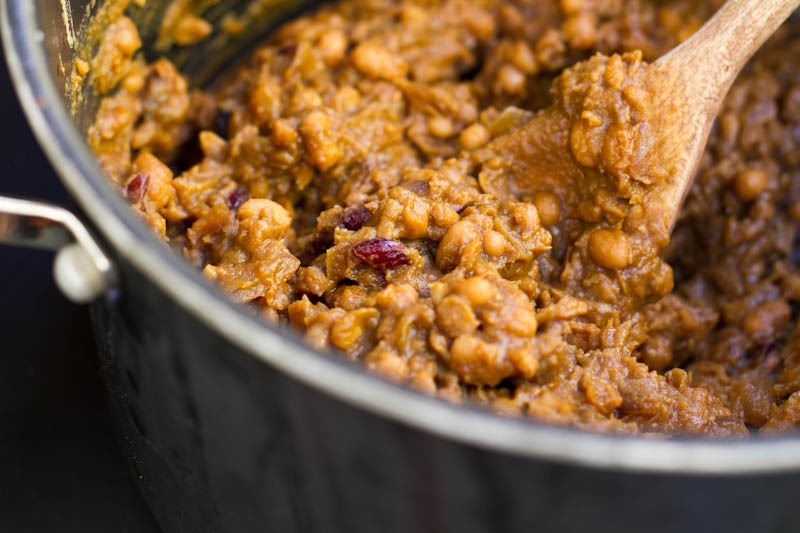 I have made this recipe twice now– once with great northern beans (delicious!) and once with pinto beans (still good, but I wouldn’t recommend them as the ideal choice for this dish). Both times I used whole wheat flour for the cornbread and substituted 2.5 tbsp brown sugar and an additional 1 tbsp maple syrup for the molasses. All the flavors really come through, and I love the cranberries for a little extra tartness. Using the whole wheat flour for the cornbread makes it thick and a little drier, but that means that my leftovers have been amazing– not too soggy at all. I made this last night for dinner. It IS amazing!! Yum! I’ll definitely make it again! Do you think coconut oil could be subbed for the olive oil? So pleased I made this for supper last night- it was really really good :) Me and my omni Mum and boyfriend all devoured it. Paired with a green salad it actually came together really quickly, especially since I halved it so cooking time was reduced. 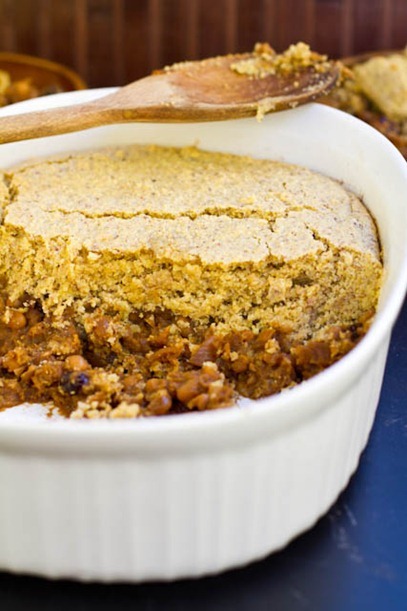 So far I only have the baked beans done… But this recipe can’t go wrong from here! These are phenomenal!!! Thank you, thank you for all of your site’s deliciousness!!! As an Aussie the notion of sweet beans seems a little bit odd. I made this with half the syrup and molasses and 2/3rds of the sugar in the cornbread. I would use even less next time. That said, this was so easy and flavoursome! I’ve never had cornbread before, loved it! This is one of my new ALL-TIME FAVORITE comfort foods. Amazing. So good. Thank you!! I tried this and it was delicious but how would you go about making it not as sweet??? Yummmm! I made this tonight and loved it. The cornbread topping has a great texture and really partners well with the beans. Easy to put together, hearty, a great meal for a cold rainy day. I highly recommend this! I really love your recipes, they are all the flavours I absolutely adore. I made this with some substitutions simply because I did not have some of the ingredients. I made it as a 3 bean version (Kidney, Chickpea, and Black) along with half spelt and half reg. flour. It was very forgiving as I used coconut milk and I forgot 1/4 – 1/2 of it. Turned out as a biscuit topping rather than bread. Even with all my “What’s on Hand” subs it was amazing . The flavouring was bang on. I just cooked up a huge batch of great northern beans and this sounds like a delicious way to use them! About how many cups do you think I’ll need? Just made it and it’s beyond delicious. Truly. What a treat! I added a little bit of baking powder and two flax eggs (2 tbsp ground/6 tbsp water, then set in freezer for about 10 mins), and used coconut sugar instead of molasses for the beans. Also used whole wheat and spelt flour. The cornbread fluffed up beautifully and has great consistency. We couldn’t stop eating. Grateful for all that you share! I am eating the last of the leftovers for lunch as I write this. It was wonderful! and so easy to make. I really appreciate the tip about making it ahead – – it made all the difference and was so flavorful. Thank you for sharing! This is excellent! It’s in the oven now and puffing nicely. 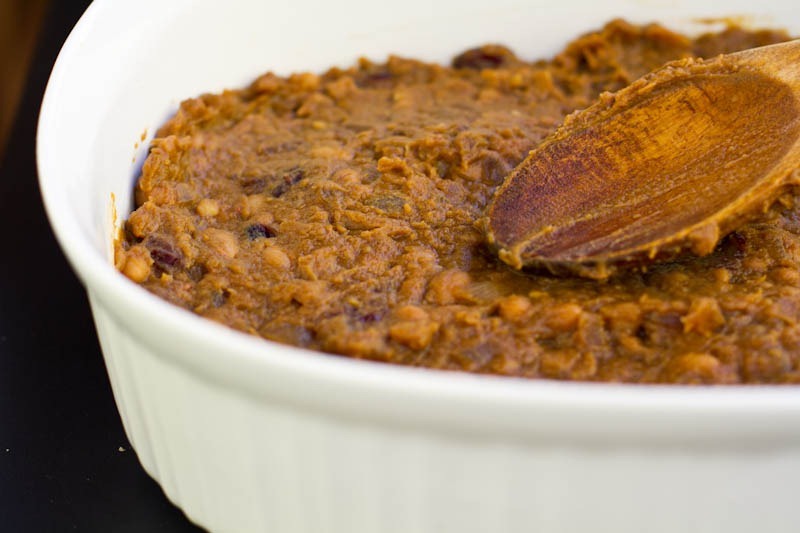 The beans part is terrific – never thought to put pumpkin in with baked beans but it’s a nutritious, smooth, lovely something that tastes divine. Thanks for a great comfort food fall recipe! Hey thinking about making this amazingggg looking casserole for Thanksgiving this year! Do you think all purpose flour will work? and Im also thinking about subbing the oil for applesauce (we don’t eat oils in my house) do you think this will work? This recipe looks so delicious! 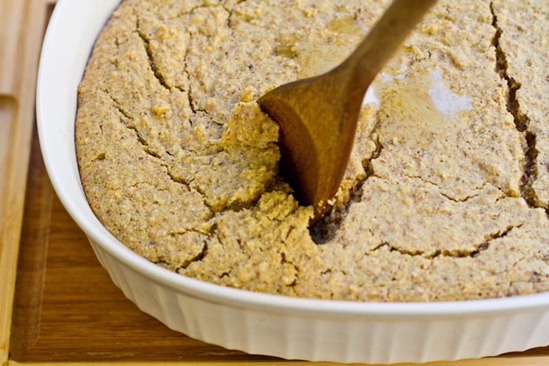 Would it be alright to replace the oil in the corn bread portion of the recipe with apple sauce? Thanks! Making this aging today. It is one of my favorites!! While I know this is more of fall dish, in my home spring is time to clear out the freezer, and I still have a ton of pumpkin in there from last year’s garden!! So glad it was a hit, Sam! Wow this looks awesome! Do you think I could omit the molasses if I don’t have that? And any thoughts on using coconut flour for the cornbread since that is what I have in the house? Thanks :)! This looks yummy! I liked it when you hide the beans at the bottom. This looks so yummy! Not to mention, it’s super healthy too. It’s the perfect Thanksgiving recipe. I can’t wait to try this out. Looks so yummy and delicious! Thanks for sharing! This is a fantastic dish, I should say. Beans, whether baked or canned, is a favorite of mine. Thanks for sharing! Oh my this was good! It turns out I cannot read even a simple list of instructions so I completely missed the part where I was supposed to cook the onions then add the bean mixture and cook to thicken. I just mixed the bean mixture in a bowl, threw it in a casserole dish and added the cornbread mixture on top before I realized my mistake. For the record, it thickens up just fine this way and we liked the slight crunchy onions. I cooked it for about 40 minutes. I think this would also work with gluten free bisquick dropped biscuit mix as a topping.